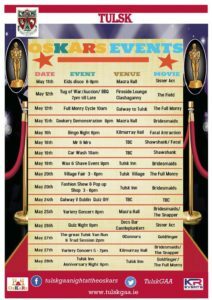 As we get closer to our big night out on June 1st , here is a list of upcoming events for the rest of April. These fundraising events are being organised by the individual films but it would be great to see as many as possible at these. We have already had a Table Quiz(Full Monty), A Car wash(Shawshank) and a 25card drive (Sister Act), all of which have been a great success. Thanks to all who supported these events and to Applegreen for allowing us to use their premises for the Car wash, Hanlys Bar Strokestown for the Table Quiz and Flanagan’s in Castleplunkett for the Card game.